Luminlay, Other Guitar Replacement Part from Luminlay. 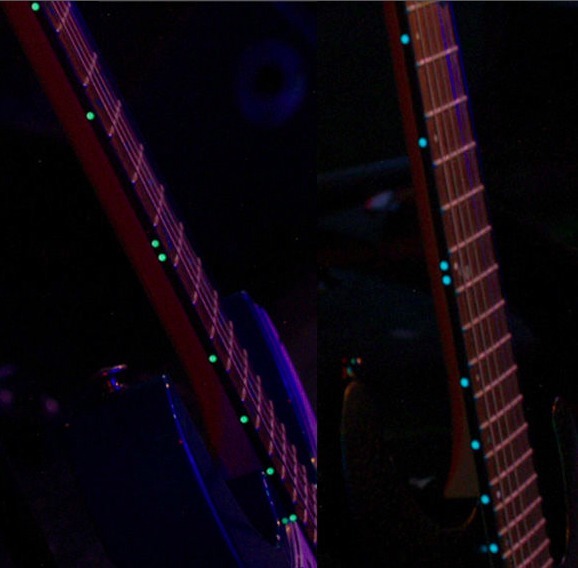 A lot of guitarists, bassists have had a problem of insufficient light on stage for years: the "Luminlay" fluorescent inlays are designed to solve this problem. It is especially problematic to see the position marks during song openings when there's no light on stage whatsoever. 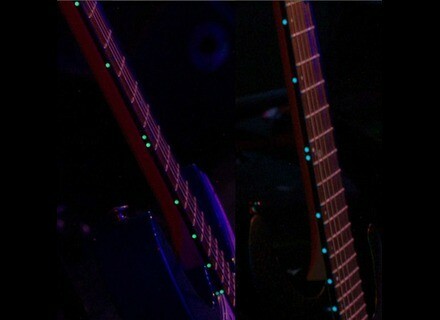 There has always been an option of using LED lighting to highlight the position marks, but why take a chance to damage the neck? Besides, you would also need a battery and a lot of money for its installation. There were some attempts of using luminous material for side positions but the light just wasn't strong enough. There are two color types of Luminlay, one series glow green, and other series glow blue. The product comes with a small LED light charger that can be put in your pocket and allows you to charge the position marks within seconds. For more information, visit www.luminlay.com. Blackbird Guitars & Elixir Strings Team Up Blackbird Guitars has teamed up with Elixir Strings to outfit the latest version of the company's Super OM guitar. [Musikmesse] Port City Pearl Amp The Pearl is designed for those tight stages as it measures only 16 7/8" W x 8 ¾" T x 7" D.
[Musikmesse] Visionary Instruments Video Guitar Visionary Instruments introduced the Video Guitar: they say they merged "spectacular video technology with your favorite musical instrument, and added a whole new dimension to live performance."